If you can't see images, please click here. 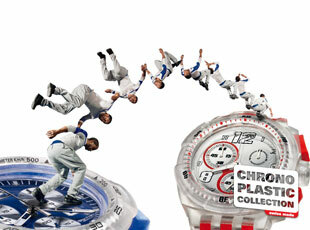 Swatch not only joined forces with GREMS to create the 2009 Swatch The Club special. There has also been launch a new range of our Swatch Chrono Plastic collection. 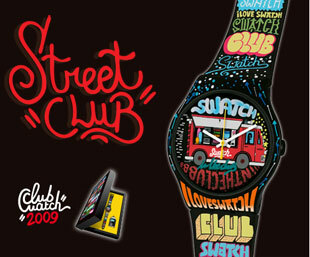 Swatch has joined forces with GREMS to create Street Club, the Club watch for 2009/10 and the latest product of the Swatch + Art connection. Both Swatch and street art celebrate street-level creativity and are products of popular imagination — ever-changing expressions of non-stop urban culture. Street art reveals the explosive desire to explore all possible forms of expression. Popular and intentionally provocative, street art undermines expectations, using bold and colourful graphics coupled with humour, irony and visual wit to deliver the message that art is irrepressible, the human spirit alive and well. With buying this watch you will become a member of Swatch The Club. Taking another great leap forward SWATCH presents five bold new models in the Swatch Chrono Plastic Collection. Trendy, street-smart designs combine colourful, light-weight and durable materials with precise and reliable quartz chrono movements. Each model features a ruggedized plastic case, moulded rotating bezel, accessible chrono pushers and crown, and a sporty, rough-and-ready silicone strap. Built for freedom-loving young men and women, the new Chrono Plastic models are perfect for timing outstanding performance in the urban jungle. Rugged, robust and ready to run - The Swatch Chrono Plastic Collection. Free running is free thinking. THE NEXT GENERATION OF CREATIVE TALENT? 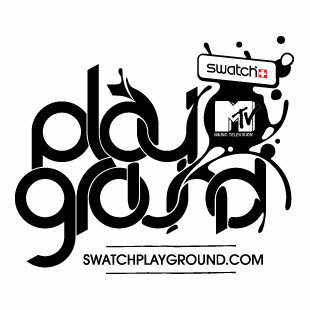 Swatch MTV Playground is an exciting new community website that aims to showcase creative talent from across the globe. The idea is to create the biggest international collective of imaginative minds and designers from around the world. And get them talking to each other. Stretch your imagination to its limits. Enter the first Swatch MTV Playground competition by answering the brief “Imagine time in the future”. Indian fashion designer Manish Arora combines high-contrast colours and intriguing shapes with Bollywood sparkle, pop culture, humour and sheer joie de vivre to create an exuberant collection of fashionable accessories for the wrist - all in the spirit of Swatch!